and bills (definitely not fun). But, this summer was different because I participated in Kat's Liberate Your Art postcard swap. Here's the deal, each artist sent Kat 5 postcards of their work plus stamps. Then, Kat did all the work of distributing them - Thanks Kat!!! So, I received colorful art cards from 5 different artists. Now that was very fun! She Dreams of the Sea, Catherine, and Kat (links added where given). Such a treat! Thank you ladies. I've decided to continue the postcard goodness by offering a group of 6 of mine. For a chance at this freebie, just leave a comment. If you want to double your chances, tell me if you are a follower of my blog or become one now. I'll announce the winner in a week, or so, and ask for your snail mail address. P.S. I had my postcards printed by MOO and found the quality to be exceptional. I am a participant in the Liberate Your Art!postcard swap. And just bloghopping from Kent, England. Nice to meet you and I'm happy to follow you about! My blog is not showing the thumbnails of other artists' work at the bottom - if you know how to enable this, I hope you will have time to let me know. Oh wow. The postcards you received are all so wonderful. But I have to say the ones you created are absolutely stunning. I'm partial to roses, and if the others are pictures of jewelry you have created, I have to say they are gorgeous. Thank you for sharing everyone's work! I'm so glad you liked Moo! I could tell their postcards a mile away in the swap. The quality is just the best. Gorgeous postcards, all. I always love your work! Thanks so much for joining in the swap and sharing your experiences in the hop! What for a wonderful idea. I read it, but it was new for me. Your photo´s are wonderful. Thanks for sharing ! How fun to continue the art!! Please count me in to your drawing. Wasn't the swap fun! So much fun to see and share all the talent. 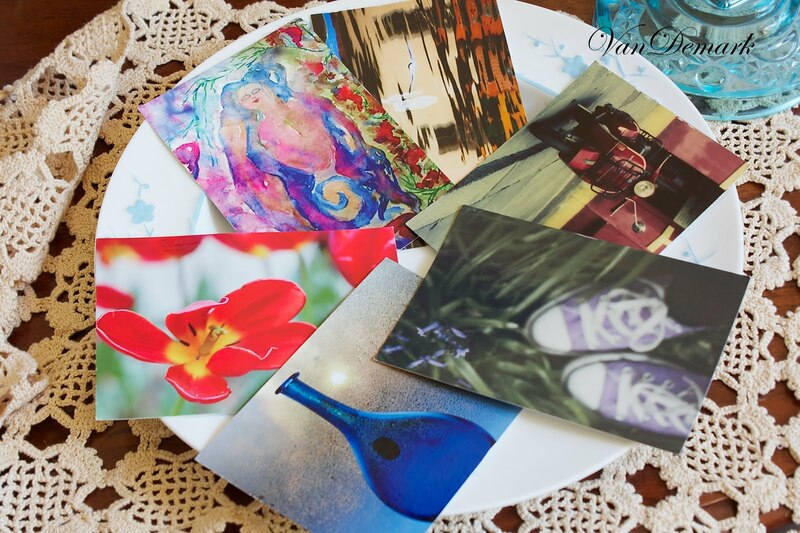 What beautiful cards you received as well as the ones you have created yourself! I too enjoyed getting something in the mail besides bills and junk! Wow! these postcards are beautiful. What an inspiring event, loved it. I have become a follower of your lovely site. Fabulous art, in what came to you and in what you sent out. I really like the way you displayed them on a plate for the photograph. Thank you for sharing here! You got such a beautiful set of cards in return. And your set of cards just takes my breath away. :) Beautiful! 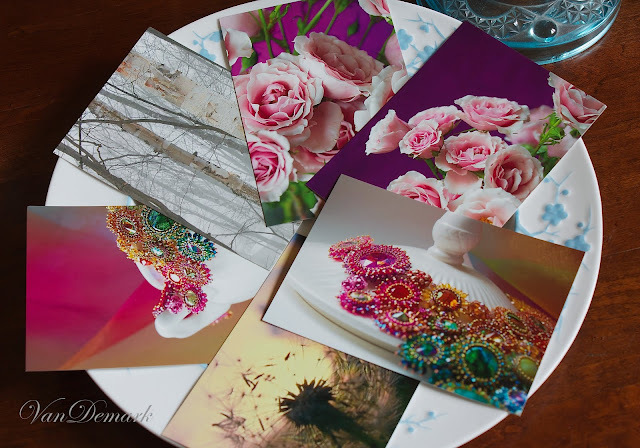 It was great fun and this blog hop is even better - I'd love to receive more cards in the mail!! Lovely postcards, and idea! Glad you had fun with the swap. Your art is beautiful. I am having fun going around and looking at all the loveliness! Oh, just lovely! Both those received and your set as well. Your presentation here is very pretty too! This is just wonderful Anna, and you sure received some beautiful postcards! I'm loving seeing the results of this wonderful project. Next time - I'm definitely going to want to be a part. Wonderful and inspiring!!! Your postcards are beautiful (so vibrant - I am definitely going to have to consider using MOO in the future) and the ones you received are great! yay! i am so glad you got one of my postcards. thanks for linking to my blog today! This was such a fun swap. Your art is really beautiful. That was one incredible swap. I'm excited for the opportunity to win a set of yours. I, too, follow you (officially now) although you have been a favorite in my reader for quite some time. I too participated in the Liberate Your Art swap. Just blog hopping from Long Island, NY! I am coming in late because of my chemo treatments and hurricane Irene!! Nice to meet you and your pics! Your postcards are really beautiful. I love the way you made your subject matter pop.